Barb Devlin was among about 300 Rotarians in attendance at the January 26 Mid-Term Assembly. 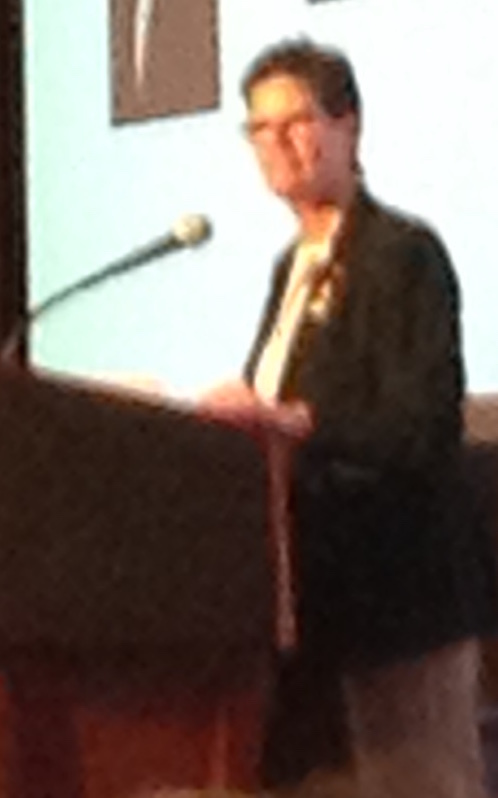 As District Governor Irene Kelly welcomed everyone, Rotarians made donations to Polio Plus. 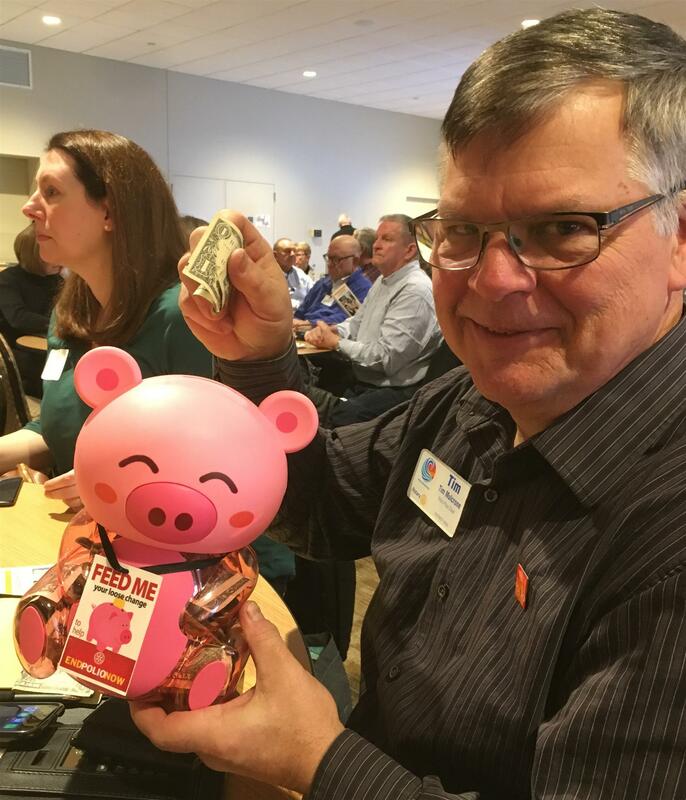 District 5950 Polio Plus Chair, Tim Mulcrone (right), happily placed Barb's contribution into his "Year of the Pig Polio Plus Bank." 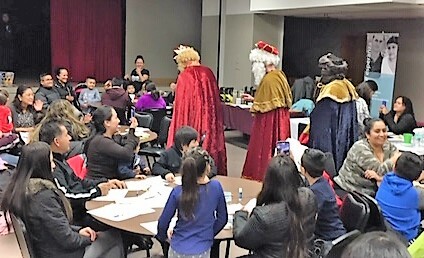 The Mid-term Assembly also included an Information and Sharing Fair highlighting District 5950 and club projects and activities, including a new Leadership Fellows program that will launch in September 2019. Barb hopes that Richfield Rotarians will be part of a future District Assembly to share information our Little Free Library project! 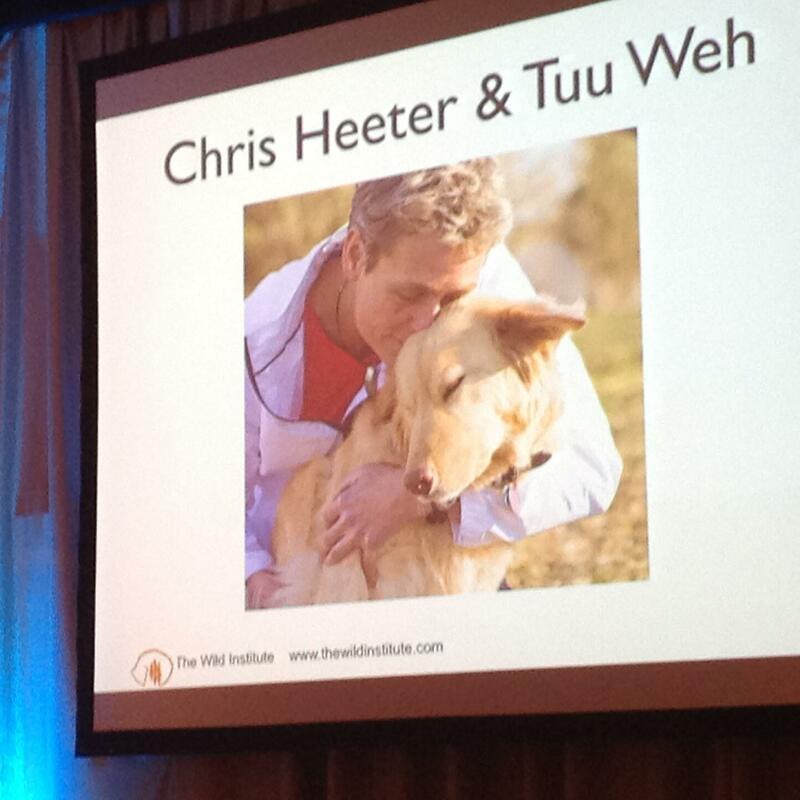 Congratulations to Chris and Denise!! 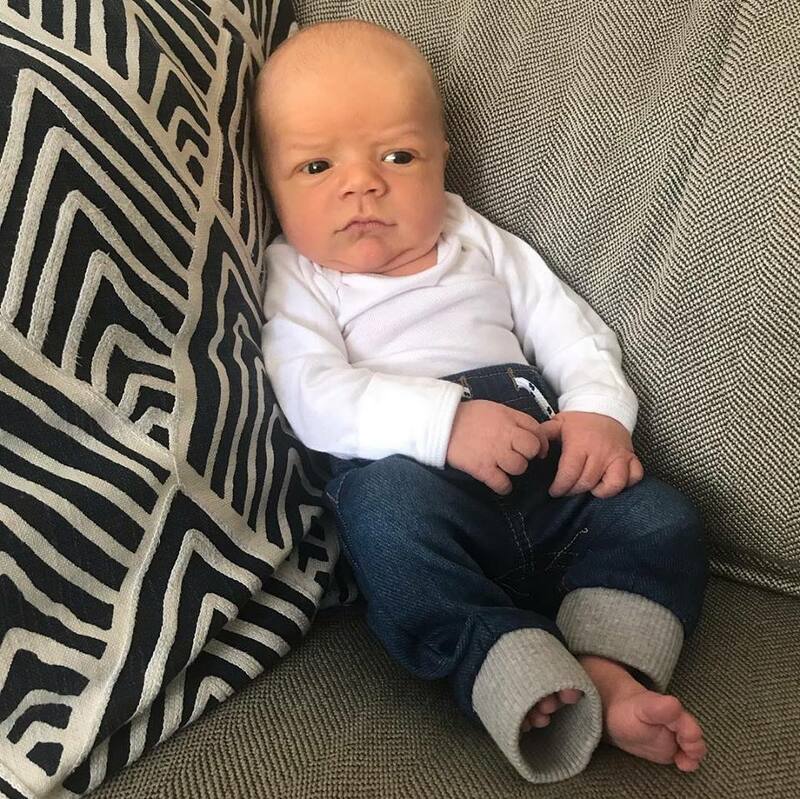 Our heartiest congratulations to Richfield Rotarian and New Dad Chris Walsh and his wife Denise on the birth of their new baby boy, Hayes! expressions of interest in receiving a LFL and offers to help with construction and /or contribute financially. 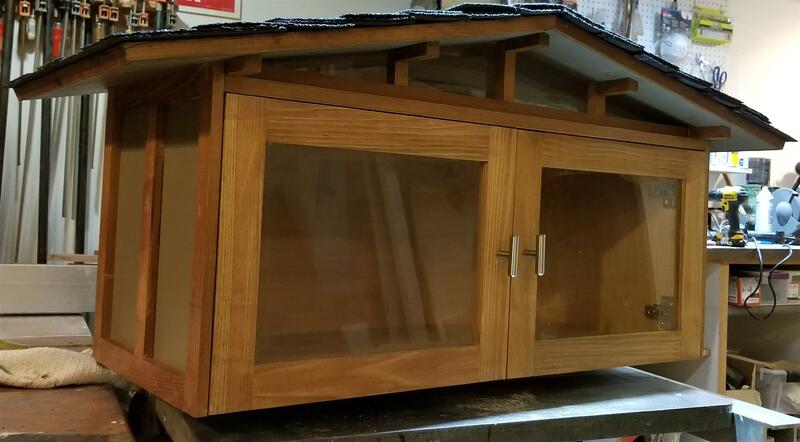 The Richfield Rotary club is developing a Little Free Library (LFL) project that will offer a limited number of LFL's available for installation late spring early summer of 2019. The club is looking for feedback from the community as to interest in the project. The LFL's will be available for a small nominal fee (as yet to be determined) so that individuals/owners will be invested in the project. A "LFL assembly day" will be scheduled and interested community members can assist with the final assembly of the LFL's (basically screwing them together and painting, all the parts will be pre-cut to size). Richfield Rotary believes the project will promote literacy and add to the overall welcoming appearance of the city/neighborhood. Comments and or expressed interest can be made below or by messaging the club through our Facebook page at Rotary Club of Richfield Minnesota. At left is the "deluxe" model of the Little Free Library, which will be raffled off to help provide additional funds for the project. Thanks to Jay Clark for contributing his time and talent! 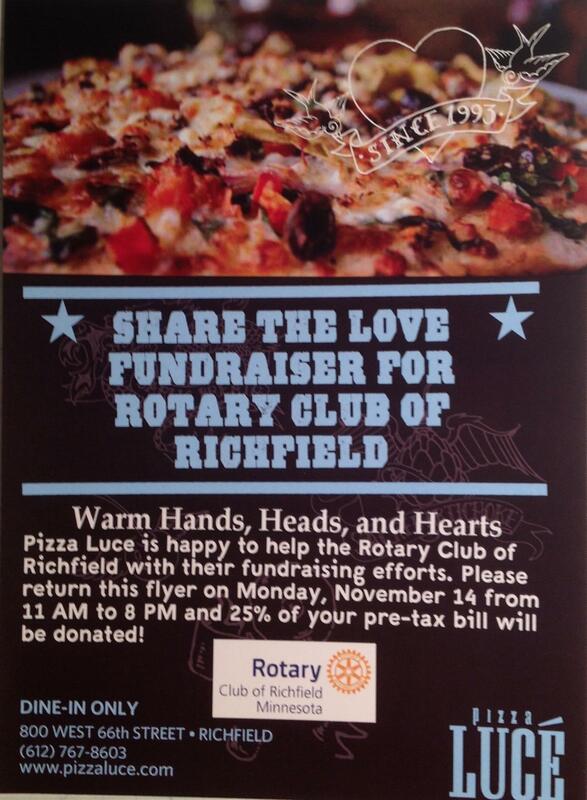 Richfield Rotary designates one meeting per month for an evening service project / social. 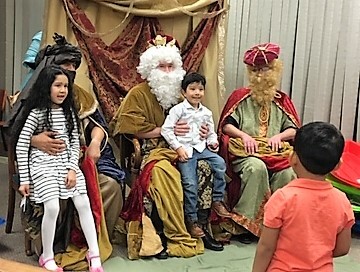 Our service project for January 2019 was helping the Latino Resource organization, MIRA, with its Reyes Magos (Three Kings) celebration on January 4. Richfield Rotarians and spouses who helped out included Jay Clark and Chris Walsh (two of the maji! 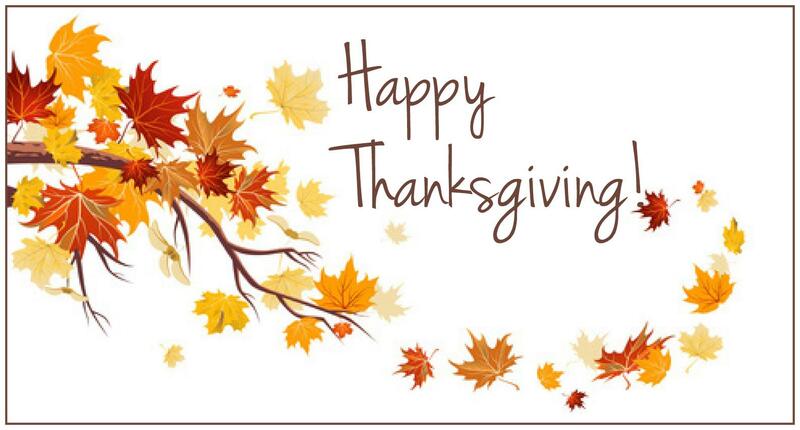 ), Bridget Clark, Barb and John Devlin, Chip and Deanna Groth, and Dave and Joan Melcher. 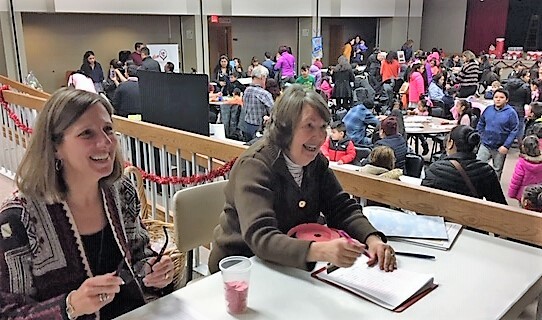 MIRA’s treasurer Rosa Rubio reported attendance of about 400 children and adults and added, “Great work everyone!!! Our most sincere appreciation to all the Rotarians that helped and donated for this event!!! It would not have been possible without all of you!” The photos provide clear evidence that everyone present - including the volunteers - had a lot of fun! Heart of Dance Volunteering Brings Smiles! joined many other volunteers and dance enthusiasts at the seventh annual Heart of Dance team match, which brought together children from classrooms around the state. Richfield Rotarians registered schools, handed out programs, pinned team sashes and color names on dancers, and helped manage dancers in the "on deck" area. President Kirsten Nielsen was one of the event sponsors. Thanks to Kirsten, Jay Clark, Pat Dale, Barb and John Devlin, and Jay Clark for supporting these young dancers! in the front of dictionaries to be presented over the next several weeks to all third grade students in Richfield public, non-public and home schools. Thanks to Jean Fox for processing the dictionary order, Lynne Alexander for obtaining the donation labels, and to HaeKyung Thompson, Dictionary Project Chair. 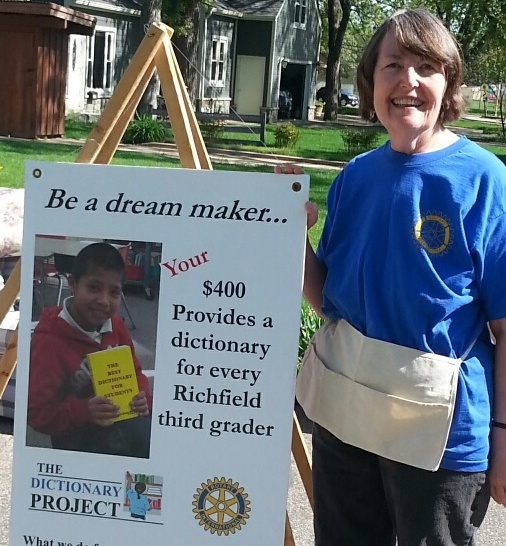 See the “Richfield Rotary in Service” section below for more information about the Dictionary Project and when volunteers are needed for delivery to schools. For our December service project, we'll be providing volunteer support for the “Color of Rainbow” Team Match Event, which will bring together children from around the state to form a larger "dancing family" representing Minnesota’s diverse cultures and ethnicities. The team match confirms the core values of the Dancing Classrooms program: mutual respect, tolerance, teamwork, sportsmanship and elegance amongst children. Registration/Dancer Check-In: Before each competition begins, you will help check in participating students, collect permission slip signatures if any are missing, and direct students to their school’s section. Audience/Volunteer Check-In and Passing Out Programs: Throughout the competition, you will help to orient audience members, answer any questions they may have, ask guests to sign up for more HOD updates and information, and pass out programs. You will also help check-in volunteers and direct them to their positions if need be. Team Coordinators: You will make sure the correct students get to the on-deck area for each dance throughout the competition. You will also help pin sashes and color names to each dancer’s clothing, and assist parents in signing up for alumni dance opportunities and filling out surveys. More details to come day of. Deck: You will help get students to the on-deck area, and manage overall flow of the event by assisting Team Coordinators with managing students. Scoresheet Runners: During the competition, you will take score sheets from the judges to the scrutinizer to calculate points. 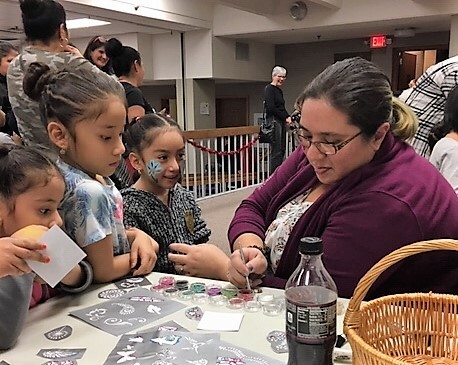 With glitter tattoos and a bean bag toss as attractions, representatives of the Richfield Rotary and Optimists clubs had an opportunity to speak with many Richfield area residents about the two service clubs and their activities. About 30 people completed a Richfield Rotary survey regarding possible future club priorities and activities. 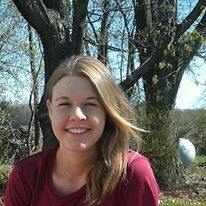 President Kirsten Nelson is hopeful that additional feedback can be obtained via the Richfield Community Page and our Club Facebook and web pages. Copies of the survey and updated Richfield Rotary flyer will be made available to members at our next club meeting. Recently, one of Jay Clark's patients told him about the eastern Indian holiday, Diwali. See the Thought for the Week section for inspiration from Diwali, "the festival of lights." John Devlin shared greetings from our most senior member, Tommy Thompson. Tommy is currently residing at Tower Light Senior Living, 3601 Wooddale Ave S, St Louis Park, MN 55416, and welcomes visitors! HaeKyung Thompson is in the process of scheduling dictionary deliveries to 3rd graders in all Richfield schools. Stay tuned for more details and a chance to volunteer. Chip Groth shared that the student Richfield Rotary sponsored for Camp Enterprise was selected as the CEO of her team’s company! The student and her DECA advisor will be invited to a future club meeting. Chip is arranging for distribution of hats and mittens to the Richfield Schools. 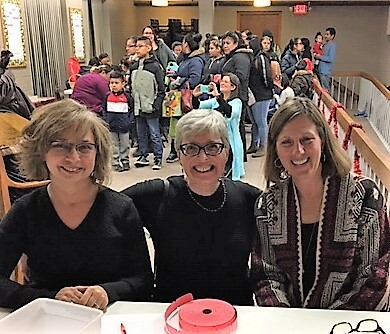 President Kirsten Nelson proposed that Richfield Rotary provide volunteer assistance at an upcoming Heart of Dance “Colors of the Rainbow Team Match,” on Saturday, December 8, as our December volunteer project. There was general agreement, with 11 AM – 1PM as the preferred volunteer time slot. Kirsten will confirm and get back to us with more details. Barb Devlin introduced members to ClubRunner, the online platform used by Rotary International, District 5950, and Richfield Rotary to facilitate information-sharing, communications, and record-keeping. Her goal was to get all members signed on, check and edit their personal profile, access the club member directory, and learn now to send e-mails to club members through ClubRunner. Denny Fox, our club web master and all-around tech guru, was on hand to assist. Unfortunately, the ClubRunner tech department chose precisely the time of the presentation to perform some ClubRunner servicing, which made the application inaccessible! As a further complication, the "Links" feature of ClubRunner is not active at the moment, so Barb was unable to create a link to the presentation outline, which provides step-by-step instructions for doing the activities on your own. As soon as this feature is active, Barb will e-mail it or include it in a future e-Spokester. The fourth meeting of each month will be replaced by a service project, scheduled for Saturday, May 4, 9-11 AM. 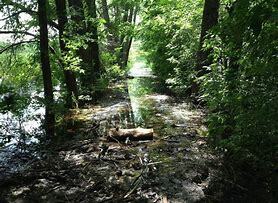 For our April / May service project, Chip Groth is working with the City of Richfield to schedule a park clean-up, most likely an area within Woodlake Nature Center. When the location is finalized, Chip will send out an e-mail with details. We hope you’ll be part of the Richfield Rotary park clean-up crew. Please invite family members and friends to join us as well! Please forward agenda items to Kirsten Nelson. Thanks! 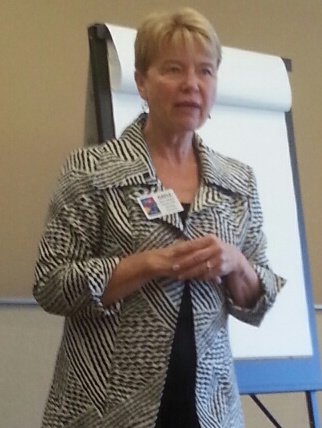 Program: Barb Devlin, "Unraveling the Mysteries of ClubRunner!" Saint Paul Saints Game a Hit! The Saint Paul Saints may have lost the game, but Richfield Rotarians had fun despite the score! Thanks to Jay Clark for organizing a great celebration of Chip Groth’s two years as President of Richfield Rotary. The Groths and Devlins arrived by light rail, where they joined several other Rotarians and spouses for a pre-game libation and food at the Ox Cart Ale House. The entire group convened at the Saint Paul Saints ball park. We were joined by Lloyd Campbell, District 5950 Membership Chair, who is a member of the Glenwood Rotary Club but was in town visiting his son. Thanks for two years of dedicated leadership, Chip! 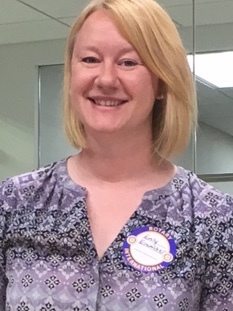 At our June 21 meeting, Nominating Committee member Dave Melcher announced that Dr. Kirsten Nelson has agreed to serve as Richfield Rotary Club President in 2018-2019! After the cheering and congratulations died down, Kirsten was elected unanimously, and outgoing President Chip Groth presented her with the 2018-2019 Rotary International banner to make it official! 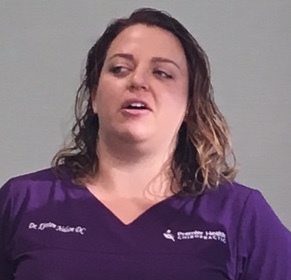 Kirsten shared that she made the decision after speaking with one of her chiropractor colleagues who will be serving as President of the Excelsior Rotary Club this year. When Kristen asked him how he would fit it in, he told her, “Oh, I’ll just squeeze it in amidst everything else I do!” After some soul-searching, Kirsten made her decision, saying "I love Rotary and thought it was important to step up." Chip Groth will be honored for his two years of service as President at a future soiree. Kirsten said, “Maybe we can have the party at our house, so we can also inaugurate our new deck!” Stay tuned for details in a future e-Spokester. President Chip Groth and Barb Devlin joined over 260 Rotarians from across District 5950 at the Mid-Term Assembly, the largest attendance ever for this event. They heard from District Governor Bob Hallagan, who highlighted contributions of District leaders and clubs. 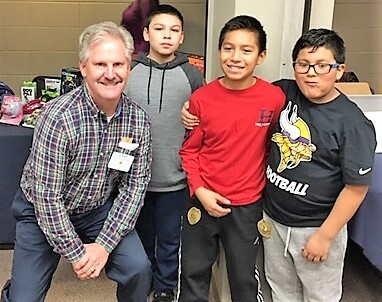 They visited booths in the Rotary Showcase, attended in-depth breakout sessions on topics of interest, and were inspired by KSTP sportscaster Joe Schmit, who shared stories from his book, Silent Impact: Stories of Influence Through Purpose, Persistence, & Passion. "People of Action: Join the Campaign"
While “Service Above Self” is the long-standing motto of Rotary International, the “People of Action” campaign highlights Rotarians being active in service. Rotary International has resources for clubs to use to show club members actively engaged: connecting, inspiring, transforming, or helping to end polio. Local clubs are encouraged to use these resources to “tell our story,” e.g. in our newsletter, website, Facebook page, or the local community page. 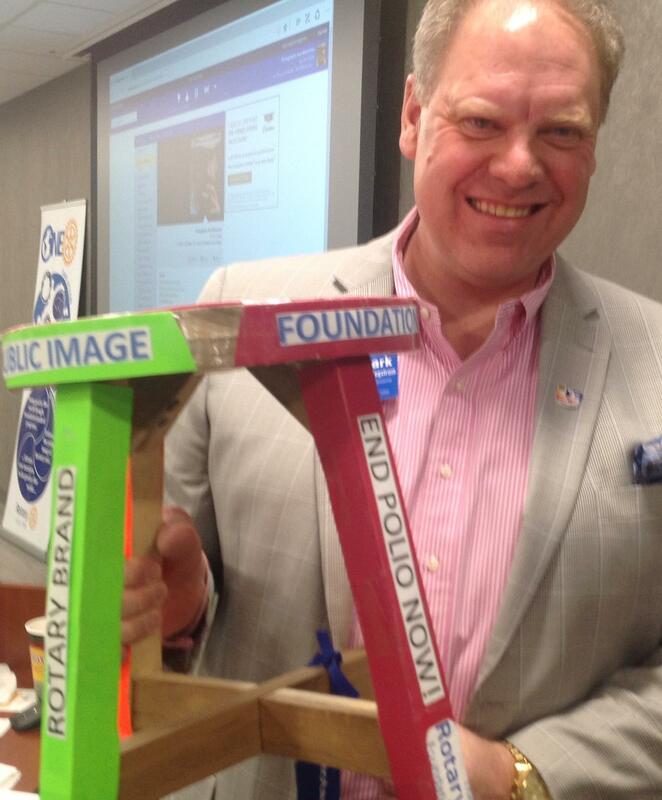 The Branding Center tool kit is available at myRotary.org. Josh Sprague, Rotary Club of Edina, introduced the session, noting that marketing of opioids by big pharma over the past 20 years has resulted in a nation-wide epidemic. “Death due to opioids is now the leading cause of death for people under age 50, and a third of the population is susceptible to becoming addicted.” Three impressive panelists joined Josh in the presentation. Rob Reynolds, Director of Advocacy, Verde Technologies (shown at left), noted that unused opioids sitting in our medicine cabinets are a tempting target. 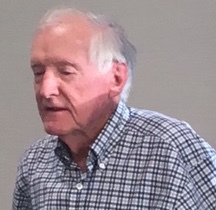 He handed out a “Deterra” packet to each attendee, a “safe, convenient, and effective way to deactivate drugs,” and suggested that local Rotary clubs could fund the purchase and distribution of these packets within the community, e.g. as part of the National Night Out event. He noted that the packet could be printed to include the name of the sponsoring Rotary Club. Sprague concluded by saying that the Edina Club remains committed to combatting the opioid crisis. Their 2018 Action Plan is set up an online curriculum ($9200) and an interactive website and video intended for HS students. Participating clubs would have access to and be able to promote the resource in their own communities. Edina has a grant proposal for a District match, but would like other clubs to participate for as little as $100. January 4, 2017 Program: "I'm Alive. Courage, Hope and a Miracle. My name is Duke Pieper and I went to Shattuck St. Mary's in 2005. I am the author of my book "I'm Alive Courage, Hope, and a Miracle." My book was recently published by a company by the name of Triumph Books out of Chicago. I was a hockey player myself I played at Shattuck St. Mary's and in 2008 I had a cavernous hemangioma. I came close to death multiple times. During the first surgery I actually had a 5% chance to live and on another occasion I was only hours away from dying . I also had multiple brain infections and the last one landed on my spinal cord paralyzing me from head to toe. From this point on I had to re-learn everything from walking to talking, eating to breathing. I believe the true reason I made it though those nine months in the hospital was to help other people! I truly believe that with the things that I had to experience and had overcome in my recovery it all was to share my story and help other people. So in my book along with telling my story on how I got through everything I put 15 bullet points in the back pertaining to how I overcame those challenges and adversaries in my recovery. I made it real general though so anyone can relate to it no matter what the situation is or no matter what your trying to overcome. I have also started a Foundation "The Pieper Hope and Courage Foundation"
Nine Richfield Rotarians joined with other Area 3 Rotarians to honor our nation’s veterans, including HaeKyung Thompson’s father, Jay Nielson, and our own David Melcher, both of whom served in the U.S. Army. We were saddened to learn that former Rotarian Herb Perry died on October 13 following a heart attack, at age 81. Herb’s business partner posted a notice on Herb’s Facebook page, along with information about Herb’s life. 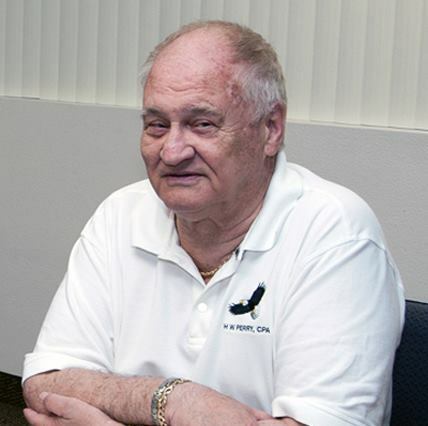 Herb spent 35 years serving clients in both the Las Vegas area and his home state of Minnesota. He grew up near St. Cloud and was married for 59 years to his wife, Darlene, who died in 2016. He is survived by his daughter and an adopted daughter, a boat person from Cambodia who he and his wife adopted during the 1970's. Herb spent winter months in Las Vegas and summer months in Richfield. 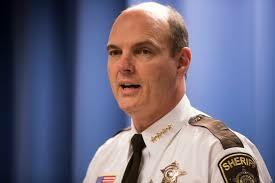 He was a volunteer deputy sheriff for many years in Hennepin County, MN. He was also public affairs director of CBS radio for 20 years at KXNT radio in Las Vegas and hosted the Sunday public affairs show. He was an AIDS activist. His 25-year-old son was one of the disease's first victims due to a lab accident, where an open wound was exposed to contaminated blood. His only son died 25 years ago. Our sympathies are extended to Herb’s daughters. All club members have a member account on ClubRunner, our website and membership service. Once you've reset your password, you can then login and access the secure member's area of our website. Please note that the Membership tab includes contact information for all club members. In this section, you can also add to or edit your own profile information. Click here to learn more about ClubRunner and visit the ClubRunner knowledge base. 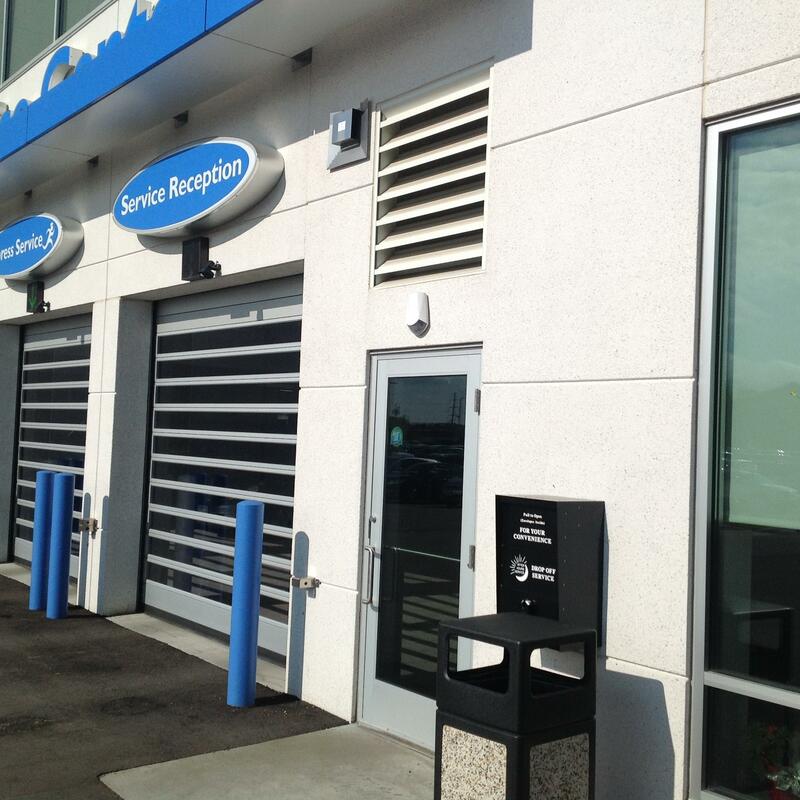 Recently, a Richfield Rotarian reported that he was no longer receiving the e-Spokester. Other Rotarians have reported this from time to time as well. Note: Click here to view how to remove blocked emails. 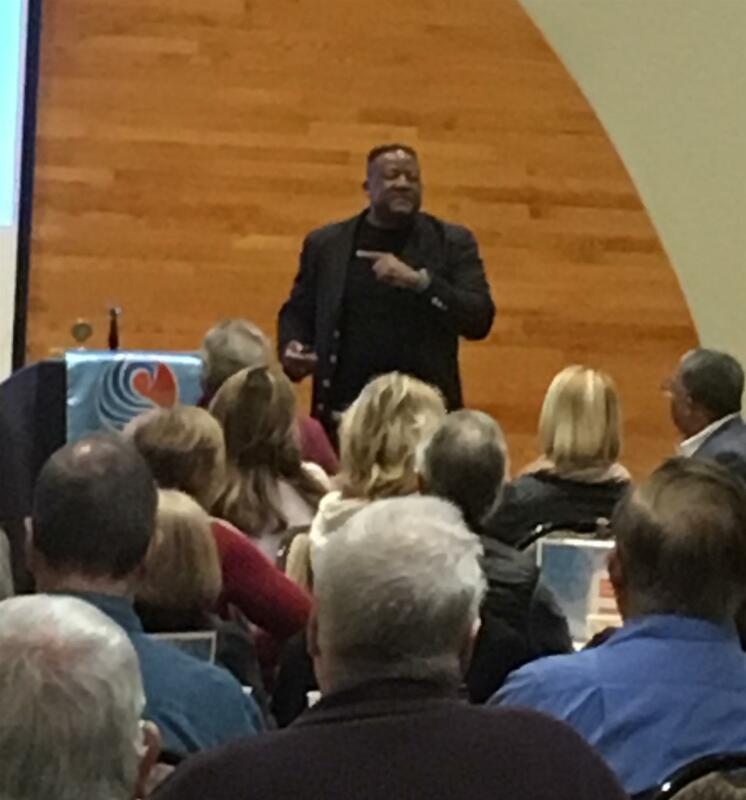 If you have a program coming up and are looking for a speaker, click here for information about a speaker who is interested in giving a presentation. There were lots of Happy Dollars in honor of Chris Walsh and HaeKyung Nielsen’s upcoming wedding. There were other reasons for happiness too! Jean Fox shared the thrill of watching her Son- in- law Paul became a US citizen. 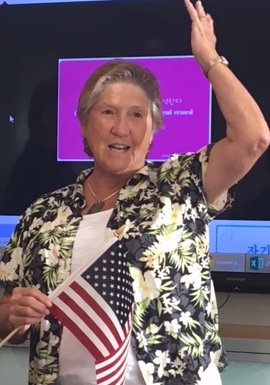 Jean noted that the ceremony included people from all over the world, and especially appreciated the presiding judge’s “beautiful message” on the importance of immigrants. Jay contributed $30 happy dollars in honor of his 30th wedding anniversary. 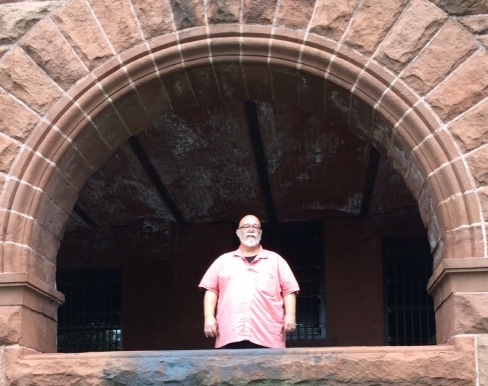 David Butler was pleased to announce that, after a five-year battle, the City Council gave final approval to construction of the Richfield Band Shell. If he looks tired, it’s because he still needs to raise another $30,000 to finalize the project! David warns, “I may be calling you…. Chip provided a list of Richfield Rotary projects and activities, many of which take place or commence in the fall. He noted that our next club assembly will focus on how to support these and other projects and activities. There will be no morning club meeting on August 17. Instead, our club will join the Edina Noon club for lunch and a presentation by Neel Kashkari of the Minneapolis Federal Reserve. Program: HaeKyung Nielsen, "A Korean Wedding"
HaeKyung Nielsen was born in Korea but was raised in the United States. Although her mother wanted HaeKyung to become “Americanized,” HaeKyung developed a strong interest in other languages and cultures. In preparation for her upcoming wedding in August, HaeKyung set out to learn more about Korean weddings, and plans to incorporate some Korean traditions into her own celebration. The couple doesn’t meet each others’ parents until marriage is being considered. Weddings are often held outdoors and incorporate Buddhist elements even if the couple is Christian. The parents determine the guests. The Pyebaek (family ceremony) is complex, with vows that must be memorized. The couple has a year to prepare. Very expensive! The average cost is $100,000, compared with $35,000 in the U.S. Features adding to the cost include multiple events, each requiring a separate wedding dress. Dresses include white (signifying purity) western-style dresses and the traditional Korean gown, called a Hanbok. HaeKyung will be wearing a Hanbok at her wedding. The reception is more of a family dinner, with a money tree in lieu of gifts. Dishes, etc. are passed down within families. After the wedding, the bride remains dressed in the traditional Hanbok until the mother of the groom certifies that she can properly take care of her son- usually @ 2 days. Duck carvings serve as an ongoing barometer of the marriage relationship. If the ducks are facing each other, all is harmonious. However, if one or both ducks are turned away, one or both members of the couple are dissatisfied, which prompts them to work to resolve the problems. HaeKyung - May the ducks in your marriage always be facing each other! Richfield Rotary has several members who are unable to attend most morning meetings. For the past year, the group has held one planning / social meeting and one service activity each month. All Richfield Rotarians are invited to participate in the evening group's monthly meetings and service projects. The evening group has a Facebook Discussion Page, open to Richfield Rotarians and friends of Rotary who request to be included. Contact Laura Briggs if you would like to be added to the Facebook discussion page. District Conference - A Play in 3 Acts! This year’s District Conference was a unique 3-Act production at the Guthrie Theater. 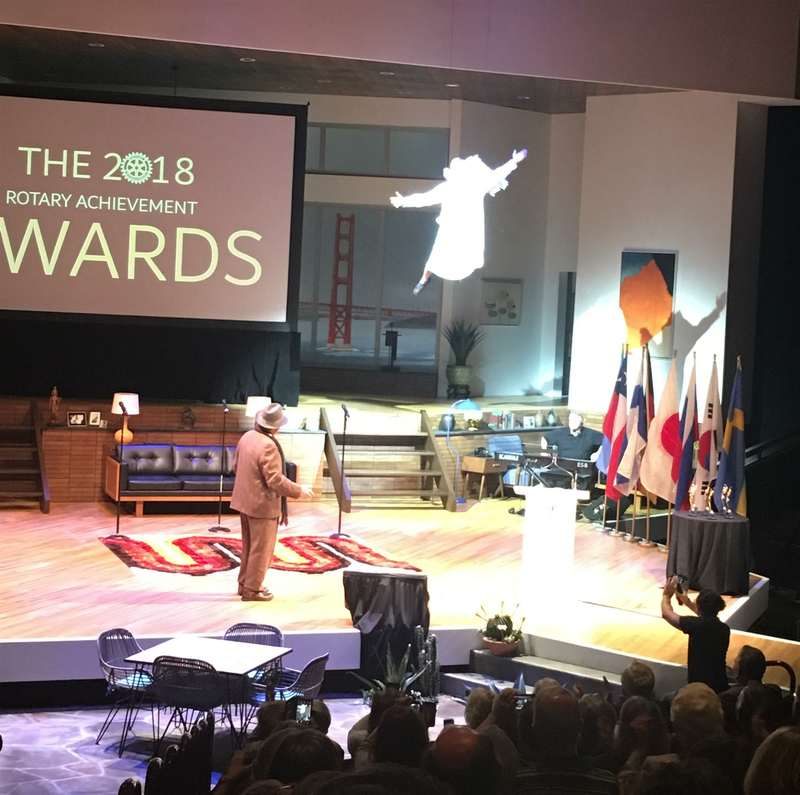 Act I featured Past District Governors Jim Nelson and Tim Murphy as George and his guardian angel, Clarence (photographed at right, descending from Heaven! 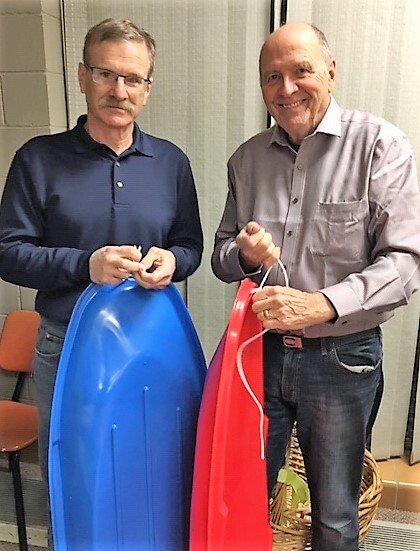 ), who presented "angel wings" to District and local club projects and initiatives that have created “A Wonderful Life” through the power of Rotary. Richfield Rotary has made financial contributions to two of the recognized projects, the District 5950 tree planting initiative and Edina Rotary's project to combat opioid abuse. 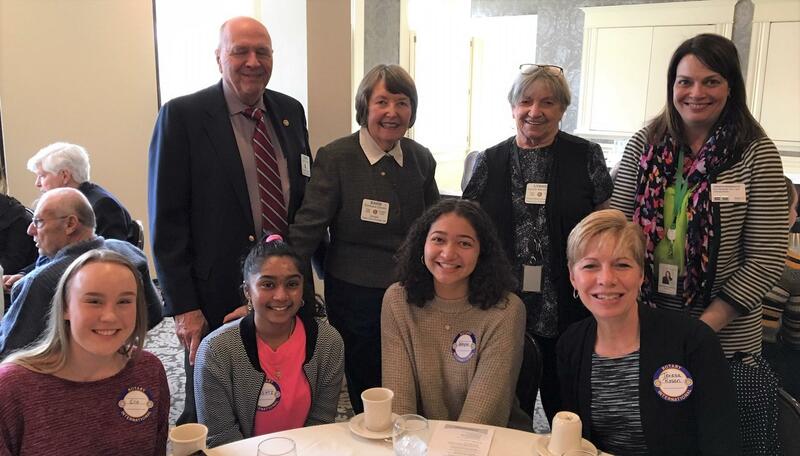 Rotary Youth Exchange students were introduced by country (right), and District Governor Bob Halagan also recognized several clubs for increasing female membership, including the Rotary Club of Richfield with over 50% female membership. Act III, “Back to the Future,” occurred after the Richfield Rotarians went home. 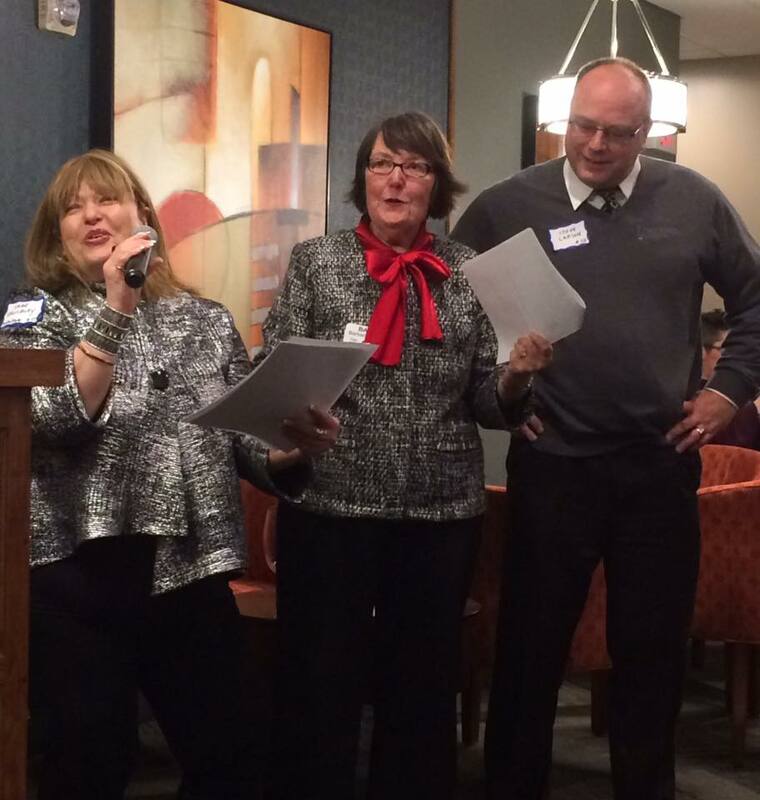 However, Barb Devlin, Chip Groth, and Jean Fox (pictured at left in costume) agree, “It’s a Wonderful Life” as a part of Rotary! Join us for a day of inspiration and celebration! barb busted the BRACKETS for polio plus!! 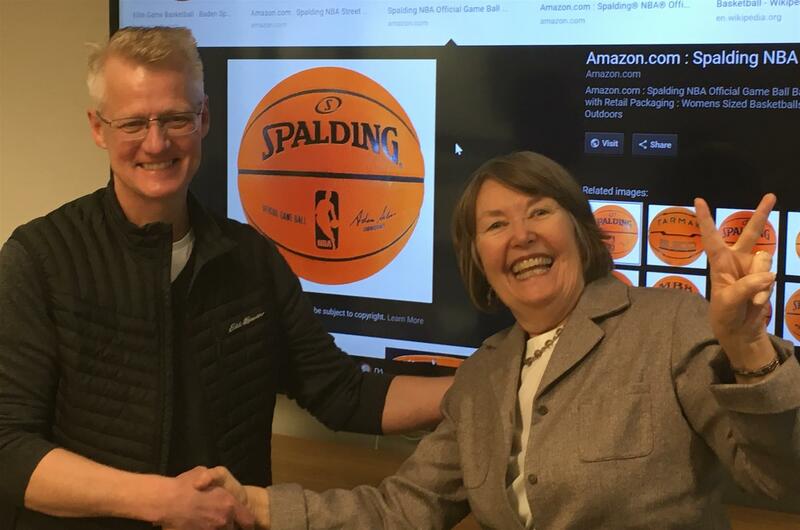 Congratulations to Barb Devlin for her victory in the March Madness Challenge for Polio Plus. 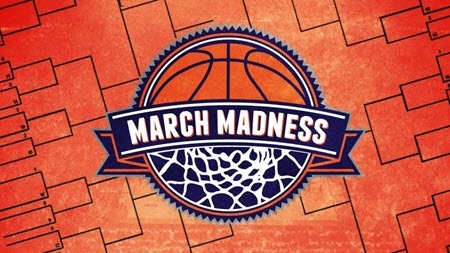 Barb relied on tips from experts, plus blind faith that the Minnesota Gophers would advance to the second round! Thanks to everyone who participated in the bracket challenge by making a contribution of $20 or more to the Rotary International Foundation for Polio Plus. 65 Year Celebration a Success! 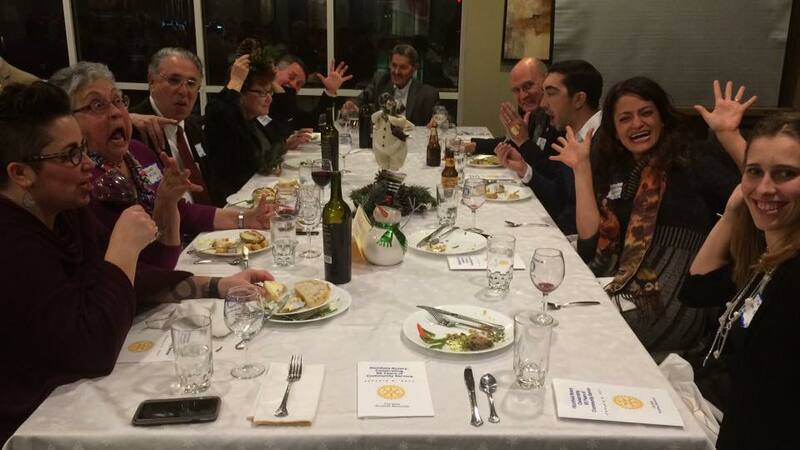 Thanks to all who helped to make the 65th Richfield Rotary Celebration on January 6 a great success! 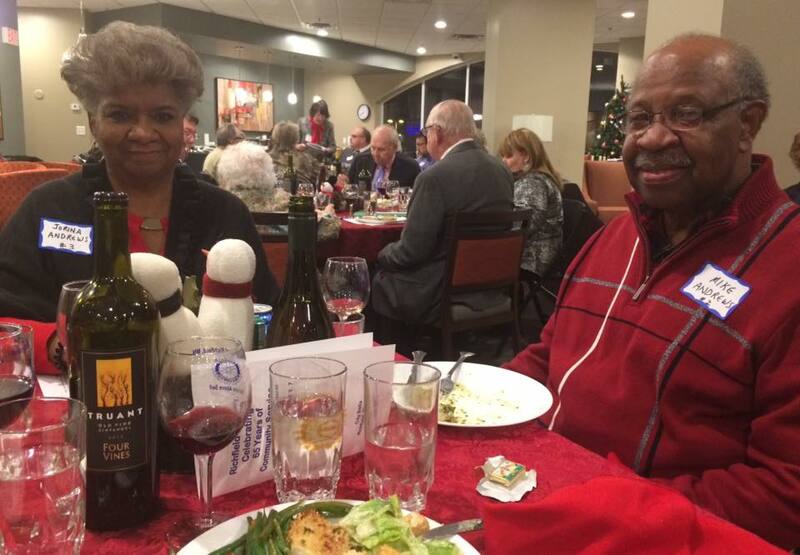 Proceeds from the silent auction and wine raffle drawing totaled about $1000. 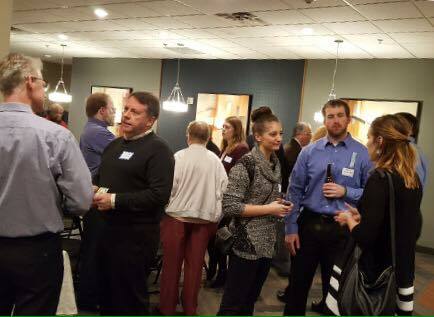 The near-capacity crowd enjoyed mingling and bidding, followed by a delicious dinner catered by Beautiful Day Catering. 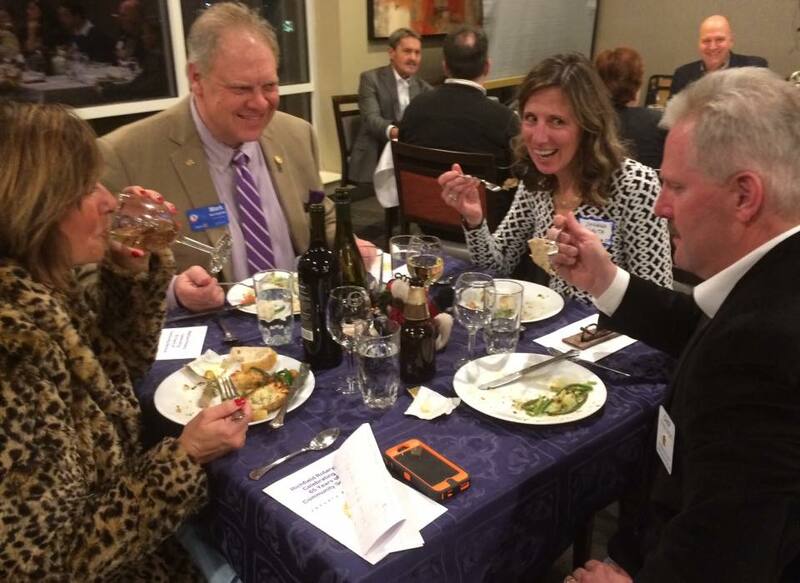 Left: District Governor Mark Hegstrom and his wife Connie enjoyed dinner with President Chip Groth and his wife, Deanna. Above: Elected officials and representatives of MIRA and Richfield Schools responded to a "mannequin challenge," while Mike and Jorina Andrews looked dignified, as usual! Kirsten Nelson emceed an enjoyable program, which included highlights from Richield Rotary history, punctuated by music from Shar Salisbury and back-up singers Barb Devlin and Steve Larson. The party was a great way to celebrate our club's contributions to the community, kick off the next 65 years of Richfield Rotary service! Click here to read “Richfield Rotary Through the Years,” prepared by Barb Devlin. Special thanks to the planning committee (Barb Devlin, Jean Fox, Chip Groth, and Kirsten Nelson) and to Dave Kostik for making arrangements for us to use the City Bella Community Room. After surveying members and discovering that over half of us will be on vacation, President Chip decided to cancel the July 13 meeting. He hopes to see us all again on July 20! In the meantime, have fun with whatever you're doing on your summer vacation! Barb and John Devlin will be AWOL from January 20 – February 19, so Barb will be unavailable to do the e-Spokester for the weeks of January 29 and February 5, 12 and 19. Thanks to President Chip Groth for volunteering to serve as temporary e-Spokester editor during Barb's absence. News and information turned in between January 20 - February 18 should be submitted to Chip. Thank you. 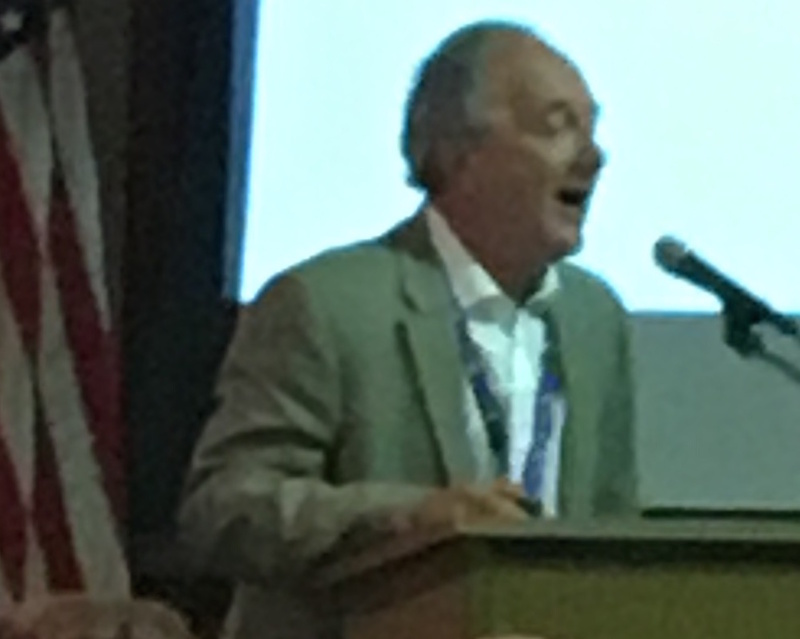 A Plea from District Governor Elect Bob Halligan! If you haven't already done so, District Governor Elect Bob Hallagan asks you to please respond to the District 5950 Rotary Survey no later than Wednesday, January 11. It will take you only 10-15 minutes, and the results will help inform decisions at both the Club and District levels. Click here to link to the survey. HELP NEEDED for January 6 Celebration!! 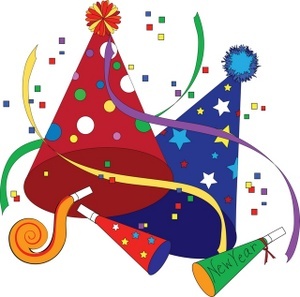 Thanks to all Richfield Rotarians who have volunteered to help out with our January 6 celebration. Following is a list of volunteer tasks, the names of volunteers to date, and volunteer help still needed. Let Barb Devlin know if you can volunteer. We'll finalize the list of volunteers at the January 5 meeting. Silent Auction donations are still needed. Click here for ideas. Contact Jean Fox or Kirsten Nelson to confirm your auction contribution(s), and bring them to Kirsten's office or to our January 5 meeting. Loan holiday table cloths or place mats for the evening - Mary Martha Butler, Barb Devlin, and Pam Serdar. Please bring table linens to the meeting on January 5. Serve as event greeters (Need 2 people inside the front and rear entrances to the City Bella lobby to admit guests and direct them to the 2nd floor party room. Help with clean-up - Barb and John Devlin, Chip Groth; could use more help. Rotary Merchandise for Under the Christmas Tree! Several Rotarians have requested information about how to orders Rotary-themed clothing and merchandise. Several blue Rotary tee shirts are available for borrowing in men's sizes (large and extra large). However, Russell Hampton and National Awards are two websites with clothing available to match your body size and personal taste, along with other Rotary merchandise. Just click on each name to get to each company's website. 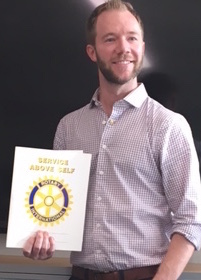 Yesterday, Richfield Rotary received 25% of the pre-tax proceeds from meals purchased at Pizza Luce from folks presenting Richfield Rotary flyers. One of the managers commented last evening, "We have seen lots of flyers, beginning with folks coming in earlier in the day." Proceeds will support our “Warm Hands, Heads and Hearts” project, which provides winter hats, gloves and mittens for needy elementary and secondary students in the Richfield Public Schools. Thanks to Richfield Rotarians, family members and friends who helped spread the word and who supported the fund-raiser by dining at Pizza Luce. We enjoyed great food and fellowship while doing good in our community! President Chip will have a report soon regarding fund-raiser proceeds. 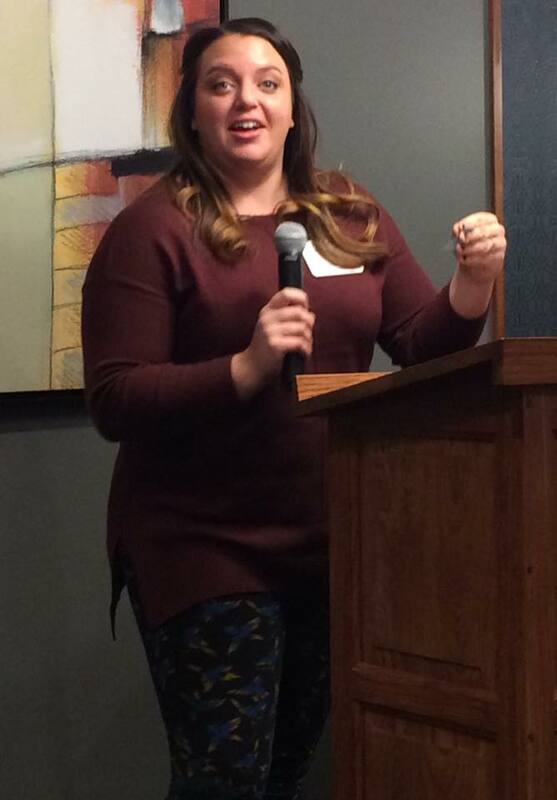 Rebecca(Becca) Erickson, Co-founder and Executive Director of Emerge Mothers Academy, is a former Target Executive, parenting-mentor, wife and mother of three. 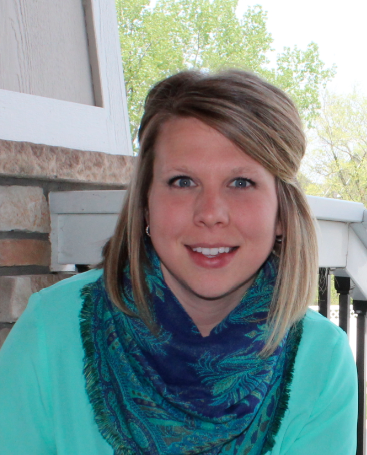 Becca is passionate about effective parenting, co-parenting and single parenting. Through her own journey she has seen the value of completing an education and committing to personal growth, even as a single mother. Emerge Mothers Academy offers parent support services to mothers in partnership with other local service sites [Hope Academy, Banyan Community, Open Door, NLFS First Care] . Becca will tell us how Emerge Mothers Academy works with moms to help change patterns of generational poverty, encourage positive parenting, personal growth, emotional maturity and financial independence. Thanks to Chip Groth for organizing a wonderful Past President’s gathering! 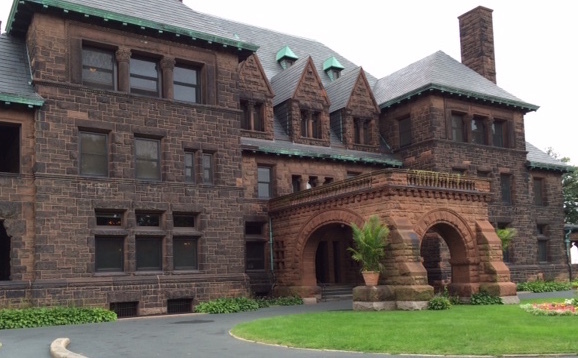 The tour of the James J. Hill House was terrific, followed by a delicious lunch at Moscow on the Hill. Of course, all of this was to thank Anthony for his leadership last year. Jean Fox took some great photos - enjoy! 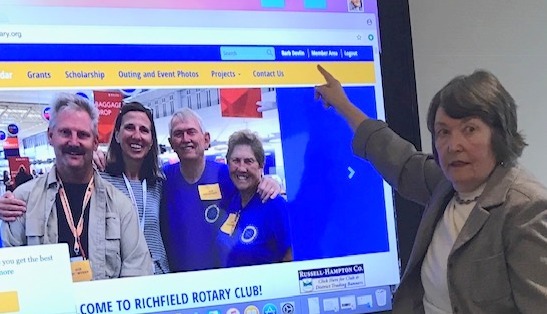 At its June meeting, the Richfield Rotary Foundation (RRF) Board decided to undertake a fund drive for the benefit of both the RRF and The Rotary Foundation (TRF). The last joint fund drive was conducted in the spring of 2015, with contributions extending through the 2015-2016 program year. This fund drive is intended to extend and build upon contributions made in 2015-2016. While TRF’s reach is broad in scope. our own Richfield Rotary Foundation (RRF) supports charitable projects and activities of the Richfield Rotary Club, which has been serving our local community for the past 65 years. A gift to the Richfield Rotary Foundation will help our club continue its legacy of service to the Richfield community. As noted in an e-mail from President Chip Groth, members are encouraged to complete and return the attached pledge form to either Chip or RRF President Lynne Alexander at your earliest convenience. Questions may be directed to either Lynne or Chip. 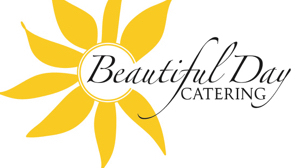 Breakfast Buffet: For just $10, you'll enjoy a delicious breakfast buffet prepared by Beautiful Day Catering. District 5950/5960 Joint Conference a Success! 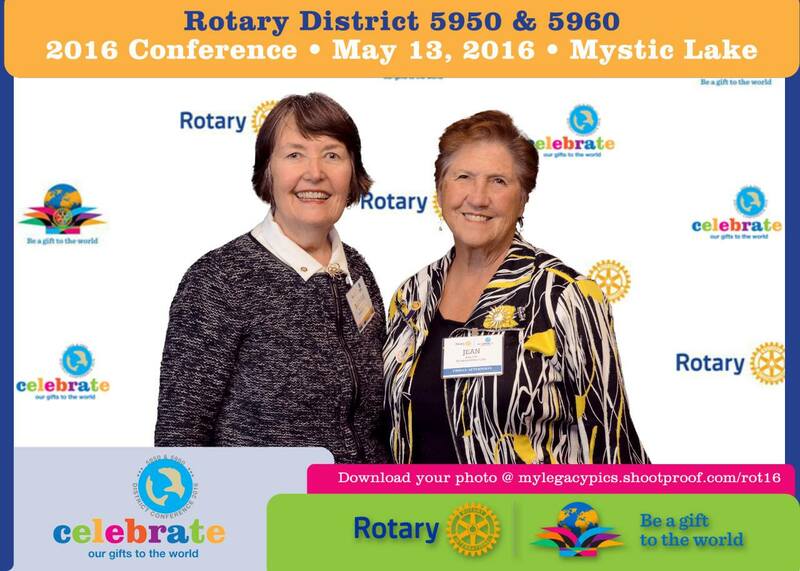 Jean Fox and Barb Devlin represented Richfield Rotary at this year’s District Conference. The keynote speakers and breakout sessions were excellent, thanks to the fact that Districts 5950 and 5960 were both sharing in the cost. Everybody has gifts. We just need to look for them. It’s not enough to show what you know; first, you need to show that you care. Mary Beth Growney Selene, a Rotary International Director from 2013-2015, served as the official RI Representative at the Conference. Mary Beth also facilitated excellent breakout sessions on attracting and engaging membership, and designing local and international projects that last. In addition to formal meetings, conference attendees also visited the “Hall of Friendship” to learn about other Rotary Clubs’ projects and activities, and helped with the “Service in a Day” project, to assemble feminine hygiene kits to benefit girls around the world. 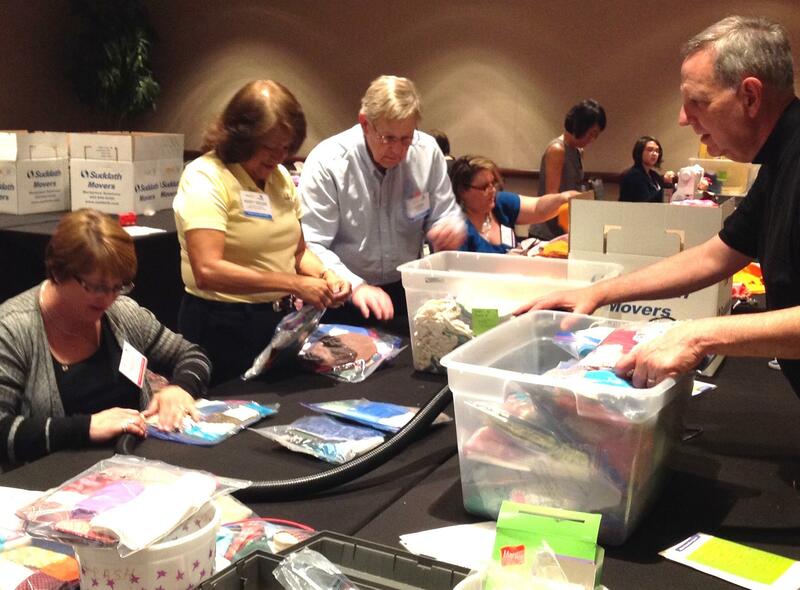 The goal was to assemble 450 hygiene kits, but over double that number were completed by the end of the day! The District Conference is a great way to learn more about Rotary, get new ideas, and meet some great Rotarians from other clubs. Make a commitment to attend next year!! Richfield High School Principal Latanya Daniels brought 12 High School Juniors and Seniors to the annual District 3 Ethics Luncheon held at Edina Country club. Students enjoyed a delicious lunch and important conversation with Rotarians and listened to a powerful presentation by Dave Irvin who talked about what happens when good people make bad decisions. 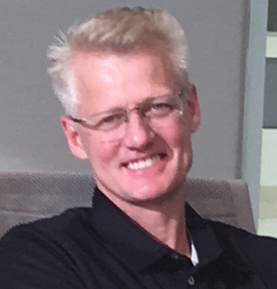 Dave Irvin had a privileged upbringing and as an adult was a father of 4, coached a youth hockey team and held an executive position. On a dare, one day he tried cocaine, and gradually became dependent. Because he could afford it, he started buying cocaine for himself and friends in larger quantities. He thought he was just being efficient and helpful to his buddies and never realized he had moved into the classification of dealing. He was finally caught when he was set up by a friend who had been recently arrested for cocaine use. When he was arrested he immediately thought "what will I tell my family, what will I tell my work colleagues, and well now I can finally quit." Rather than fight the arrest conviction he decided to take full responsibility for his actions and ended up serving a year and a day in a federal prison in Duluth. He remembers the officer telling him after the arrest that "you may not believe it now but this will be good for you"
The loss of dignity and respect was devastating but he is now rebuilding his life, renewing friendships whenever possible, gainfully employed (although not at his former executive position) and is seeking to make amends. 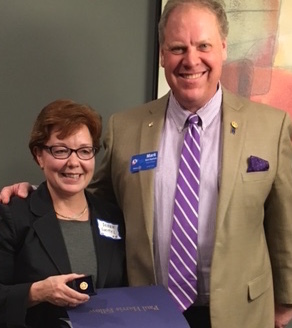 Barb and John Devlin attended the April 9 District Assembly, led by incoming District Governor Mark Hegstrom of the Edina Morningside Rotary Club. The break-out sessions included a grant-writing session led by (L to R) Don Stiles, Todd Bollig and Irene Kelly, attended by Barb Devlin. 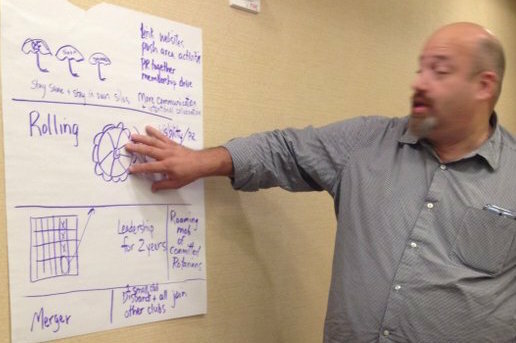 John attended sessions on visioning and engaging members. The May 12-13 District Conference will provide another opportunity for members to learn more about and contribute to Rotary. Hopefully, we'll schedule other joint events in the future! 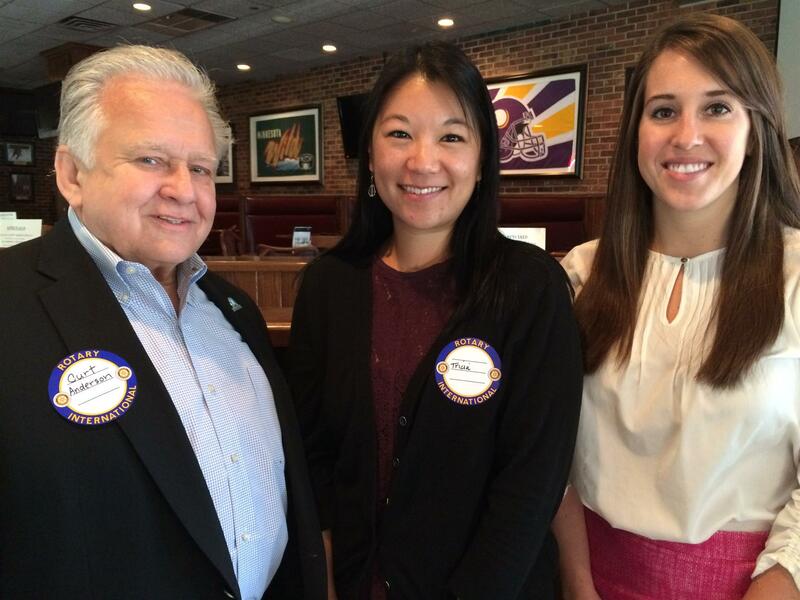 Emily Einwalter (left), lives in Richfield, and has attended both morning and evening meetings of Richfield Rotary. 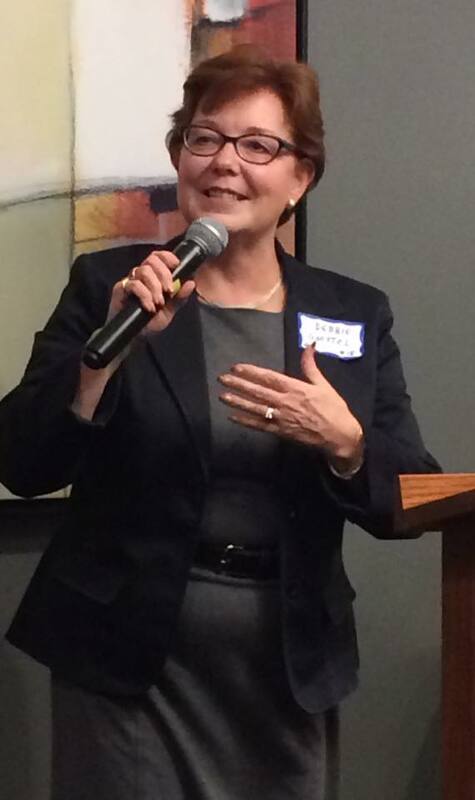 At the request of outgoing Treasurer Jay Clark, Barbara Devlin conducted a financial audit of the Richfield Rotary Foundation from August 2010 to September 2015. A copy of the audit report has been shared with current and past club presidents, and incoming Richfield Rotary Foundation Treasurer Chip Groth. Other club members may receive a copy upon request to Barbara Devlin. 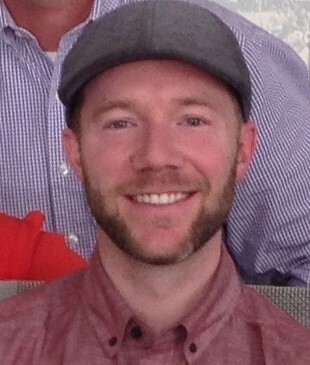 Thank you to Jay Clark for his five years of diligent service as Foundation treasurer! The primary presenter will be David Feinwachs, a health care attorney, advocate and expert on our state’s public policy regarding health care. He will be joined by Diane Peterson, a high school classmate of Steve Larson’s who also is a health care advocate. They will discuss the Five Billion dollars annually of taxpayer dollars that are unaccounted for in Minnesota’s HMO system. This will be a great meeting to invite visitors to as this is a topic that affects all of us! Thanks to Chip Groth, Pat Dale, Barb Devlin and Jean Fox for representing Richfield Rotary at the One Rotary Summit, held on September 15, 2017. Halagan observed, "By adding and diversifying our membership, Rotary can grow the Foundation, add energy and ideas for new projects, and strengthen our public image,” all goals of Rotary International. 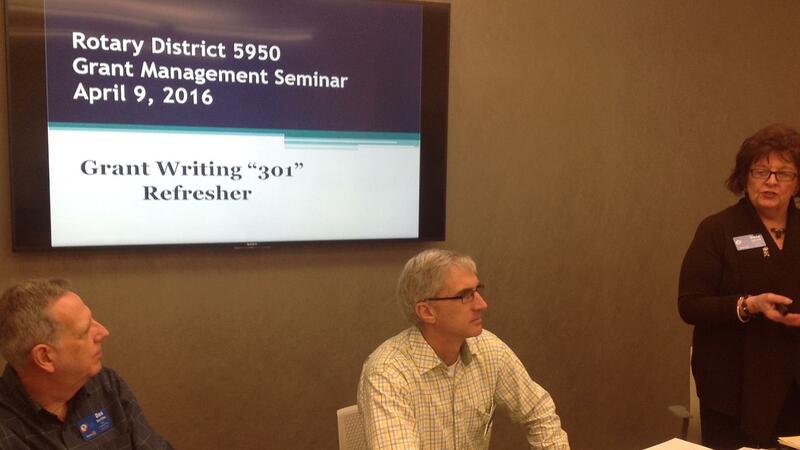 District 5950 will prepare a detailed summary of the ideas generated, which will be share with each club. The following people were elected to the Richfield Rotary Foundation last week at our club meeting. This re-establishes the 3 classes of members as per our by-laws so that we have a rolling membership. These elections should be held at the end of June each Rotary year. 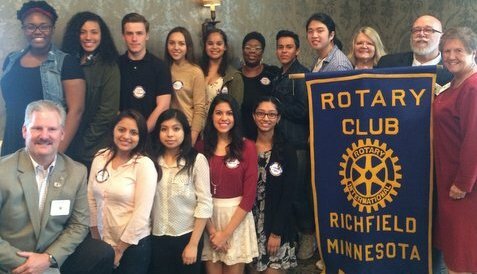 Richfield Rotary Club recognizes every member who is willing and able to attend regularly. Participation in club projects and outside Rotary meetings and activities count as make-ups for missing regular meetings. Over the last seven weeks we have five members with perfect attendance: President Anthony , Chip G, Barb D, John D and Jean F! Close behind are David B, Pam S, David M and Tommy T with only one missed meeting. Our weekly meetings and activities are essential to everyone and each one of us has an important role to perform. Thanks for being here. 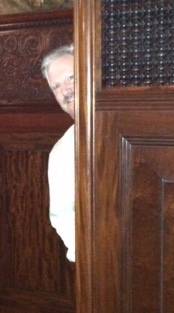 Be sure to let club secretary John Devlin also know when you attend other clubs and participate in club projects . Summer is a busy time for all of us; even so we are averaging 68% attendance. WOW! Steve Jedlund sent greetings from former Richfield Rotarian Brad Rinsem who he visited recently in Boca Raton. Lynne Alexander is celebrating the end of her lawsuit where her company prevailed. She announced "the money is in the bank"
Pam Serdar invited everyone to check out the new Little Free Library in the Richfield United Methodist Church parking lot. It looks like a little Noah's Ark. Jean Fox was excited to be going on her annual hiking club retreat near Hayward Wisconsin. 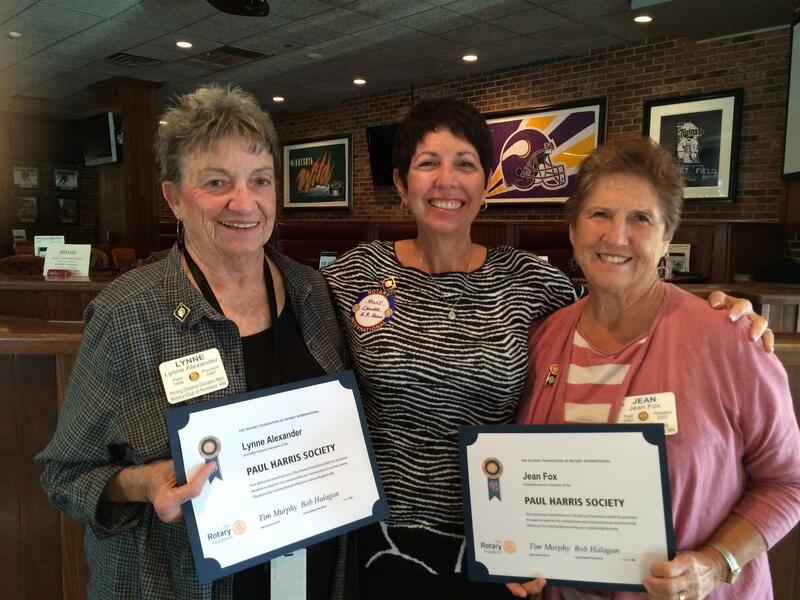 Holly Callen (District Paul Harris Society Chair) presented Paul Harris Society Membership pins to Lynne Alexander and Jean Fox. 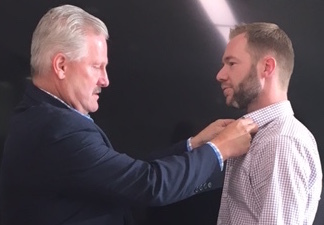 The Paul Harris Fellow designation is given to individual Rotarians who have committed to give $1000 or more to the Rotary Foundation each year as long as they are able to do so. Curt Anderson, Tricia Wilkinson, and Molly Flaig From A Breath of Hope Lung Foundation presented our program on Lung Cancer Awareness. Both Curt and Tricia are lung cancer survivors. Some of the biggest challenges in the fight against lung cancer are unfair research funding, lack of awareness and societal blame. Lung cancer claims more lives than any other cancer (16% survival rate) including breast, colon and pancreatic cancers combined, yet research for a cure is funded by as much as 20 times less that other cancers. More than half of those diagnosed each year are nonsmokers yet the general public believes that only smokers die of lung cancer and they somehow "deserve" their suffering and are blamed for their poor choices. This societal belief creates ignorance which leads to missed symptoms, late diagnoses and attitudes that hurt families. Because of this stigma, most lung cancer cases are found in stages III-IV creating a very low survival rate. The major causes of lung cancer are smoking, radon which is present in 2 out of 5 homes in Minnesota, exposure to second hand smoke, exposure to asbestos, family history and pollution. Symptoms to talk to your doctor about are fatigue, persistent cough, shortness of breath, chest/shoulder pain, loss of appetite, or coughing up phlegm/mucous/blood. If these symptoms are present ask about a low dose CT which is sometimes not covered by insurance but only costs around $125 if you must pay for it yourself. Prevention includes not smoking, talking to your Doctor about any of the symptoms above, and lowering your own risk factors. Rotarians who attended the meeting were offered free radon testing kits. The Breath of Hope Foundation, which was founded in 2008 by patients, families and their nurse, works to end the stigma, to achieve fairness in Federal Funding, increase insurance coverage to include low dose CT's and an eventual cure. They believe that every life is worth fighting for! 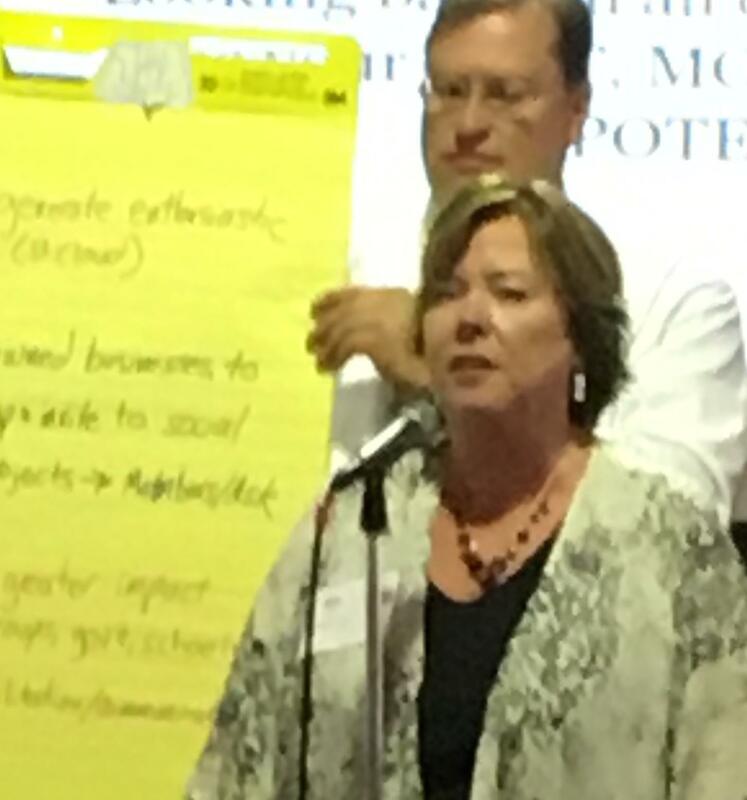 On Thursday, August 20, District Visioning Team leaders Gayle Noakes (left) and Russ Michaletz facilitated a joint visioning session that included 5 representatives each from Bloomington Daymakers and Richfield Rotary Clubs and the President of the Bloomington Noon Rotary Club. President Anthony Bradford, John and Barb Devlin, Jean Fox, and President-Elect Chip Groth represented the Richfield Rotary Club. District Governor Tim Murphy also attended. Representatives of each club shared highlights regarding club membership; priorities; community, international, and vocational service activities; and fund-raising. Similarities noted among clubs included a focus on youth (especially teens); active member engagement in projects (“sweat equity”); international project focused on India; all have membership and fund-raising as priorities. Differences include Richfield’s efforts to reflect the community’s diverse demographics in membership recruitment, service priorities, and club activities. Differences in club size also create differences in communication and fund-raising strategies and results. Expand cross-club communications to increase awareness of make-up, networking and service opportunities across clubs. Small group reporters included Barb Devlin (far left), Mark (center) and Jason (right) from the Bloomington Daymakers Club. Club presidents will ask their respective club service chairs (David Butler and/or Marlene Evenson for Richfield Rotary) to discuss possible collaborative service projects. 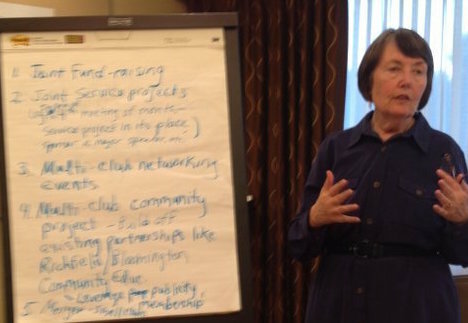 Jean Fox volunteered to meet other club representatives to plan some joint meetings. 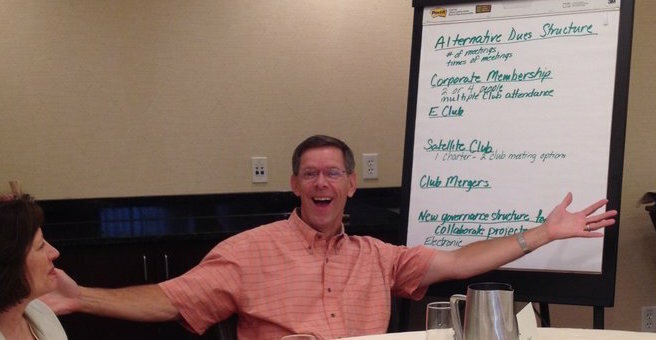 Mark from the Daymakers Club will convene the club social chairs to plan one or more joint club social / networking events. Special thanks to Daymakers President Stephanie Smith for making the meeting arrangements, to Gayle Noakes and Russ Michaletz for facilitating, and to District Governor Tim Murphy for his attendance and support. Bloomington Daymakers President Stephanie Smith and Richfield Rotary President Anthony Bradford are planning opportunities for members from both cubs to interact and get to know one another. To get things started, Anthony is seeking 3-5 members to attend the Daymakers meeting on Friday, August 14, 7:29 AM at the Bloomington Hilton, 3900 American Blvd. West. Volunteers to date include Jean Fox, Steve Larson and Pam Serdar. Let Anthony Bradford know if you would like to attend as well. Visual aids are encouraged. As an example, Stephanie’s role as a Mom is represented by car keys for driving around her son Caleb; her work in sports medicine is represented by a stethoscope, and her commitment to Rotary is signified by an End polio pin. 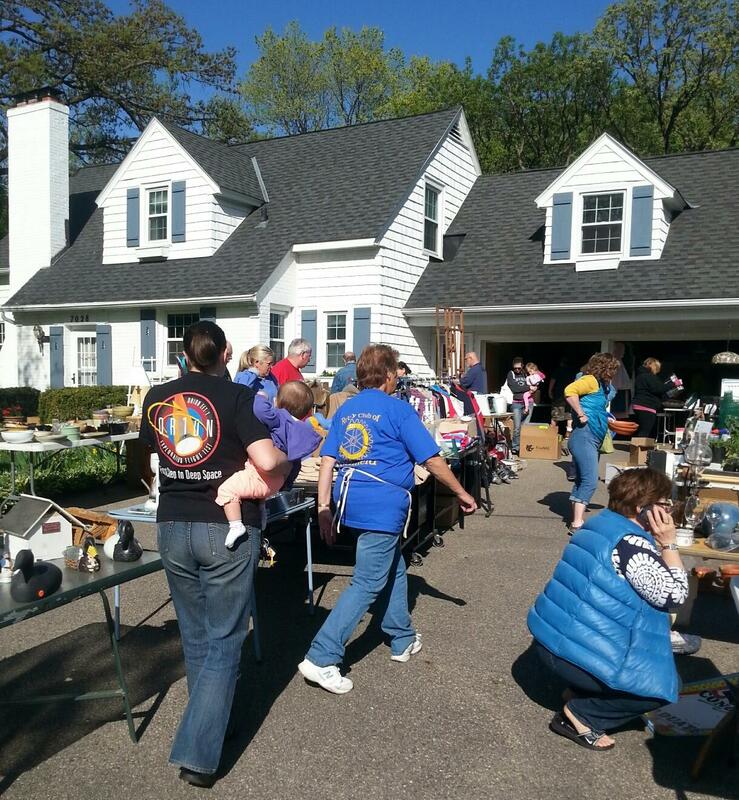 RICHFIELD ROTARY GARAGE SALE A SUCCESS! 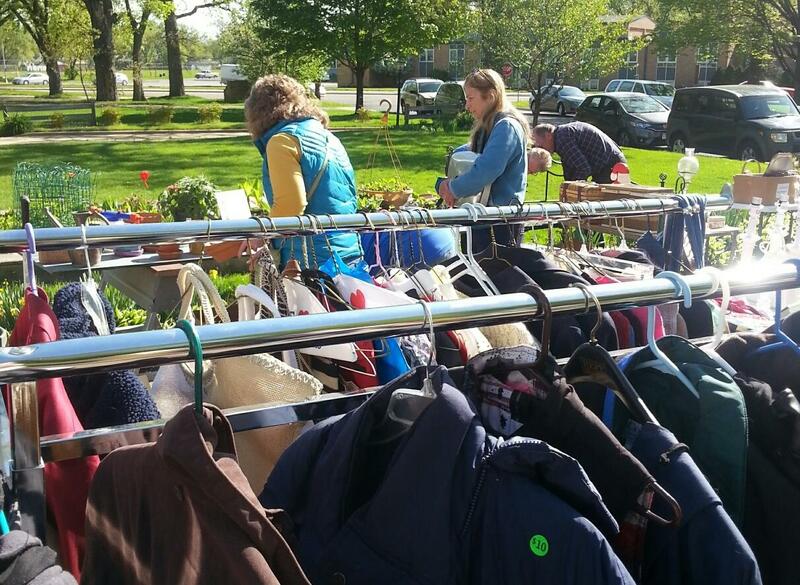 our first club garage sale since the 1970’s was a great success, yielding just shy of $2000. The money raised will fully fund the Dictionary Project in 2015-2016, and any remaining funds can be used to support other club projects and activities that benefit youth. Sandhya Gupta invites Rotary members to attend the annual fundraiser for Nari Gunjan community, scheduled for Tuesday July 14, 6-9 pm at Indian Zayka Restaurant, 1260 Town Centre Drive, Eagan 55123. The cost is $75 per person. 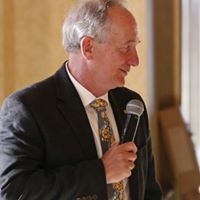 Denny Fox has completed the transition of our club website to the ClubRunner platform, which you can now log into at http://www.richfieldrotary.org. If you still want to refer to the old site, visit http://wwwold.richfieldrotary.org. Click here to access first time log-in instructions for club members. 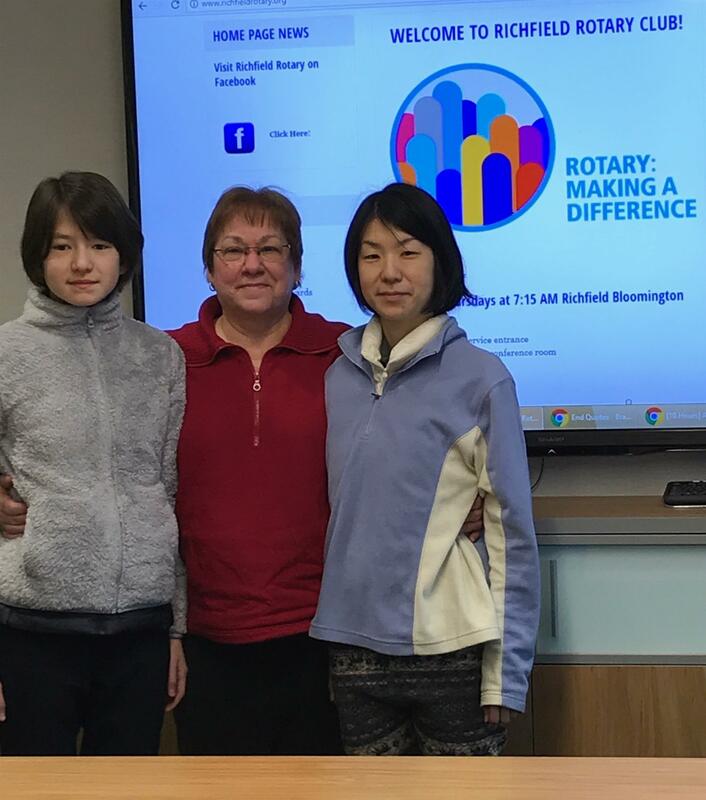 Thanks to all club members who have contributed or pledged to the Rotary International Foundation (TRF) and Richfield Rotary Foundation (RRF) as part of the combined pledge campaign. To date during the 2014-2015 program year, $5600 has been pledged or contributed to TRF and $3500 to RRF, not including contributions toward the Richfield band shell and the Darlene Day Meyer Memorial Fund. Steve Jedlund hopes to wrap up the pledge drive this week. If you have not completed your pledge, please turn it in this week so we can include your pledge in the total. A copy of Steve's letter and pledge form are attached. RICHFIELD ROTARY - 65 YEARS STRONG! 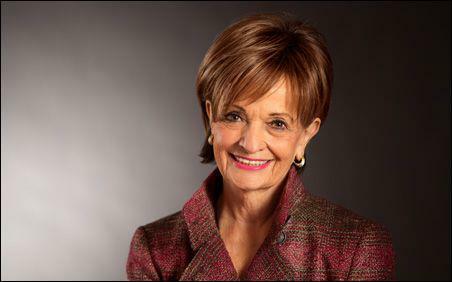 Even as we mourn the loss of Gertrude Ulrich, we join in celebration of a life well lived. With her devotion family, interest in and support for literature and learning, and life-long engagement in civic affairs and politics, Gertrude lived out Rotary's motto, "Service Above Self." Our club website and newsletter has shifted to the ClubRunner platform, which is used by District 5950 and most other clubs in the district. Here is a link to our new site. 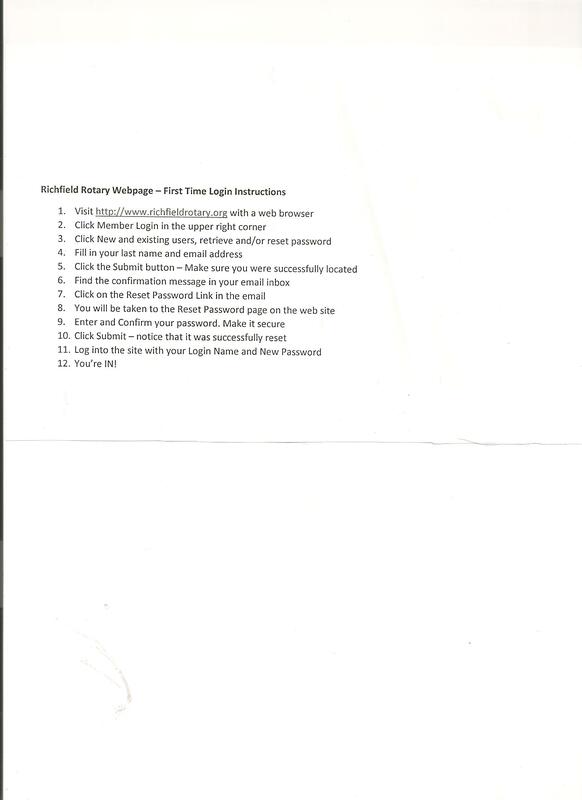 If you have not done so already, please take time to log in and set your personal password. There is a "Member Login" link in the upper right hand corner. If you click on that, then click on "New and existing users: retrieve login and/or reset password", you will get instructions on how to get yourself logged in so you can view the private parts of the new site. As before, member contact details are not shown to the general public. Review your profile Once you have logged in, please take time to review and make any necessary updates /corrections to your profile. Feel free to contact Denny Fox if you have any questions or suggestions.